Key Highlights of 2014 and Future plans for 2015. We would like to take this opportunity to wish all our clients, business partners and their families a very happy holidays and new year. All of you have made 2014 a great year for eZee and we hope that next year will also be a successful one. In our end-of-year newsletter, we would like to update you on our activities, events, product highlights and key developments that took place during 2014. Since inception of eZee, our goal has always been about providing innovative products to the hospitality market. Today, eZee is one of the few companies in the industry to provide comprehensive range of solutions that cover every business aspect of the industry. Each of the eZee products are developed and have seamless integration with each other creating a software ecosystem that naturally fits into any business environment. This intuitive model simplifies all aspects of systems resulting in streamlined operations, scalability, high usability, and most important lower costs. eZee’s success and growth over the years have been successful partly due to our strategic partnerships with various value added resellers and business partners worldwide. That was one of the area where we wanted to focus on and expand further into new unexplored markets. We signed new resellers in France, Ecuador, Zimbabwe, South Africa, Sri Lanka, Albania, Kuwait, Hong Kong and Nepal. As the market landscape keeps changing, so did our process. In 2014, we started our Partners Empowerment program which included various joint market campaigns aimed at reaching out to new clients, online marketing initiatives focusing on digital marketing and expand online presence. 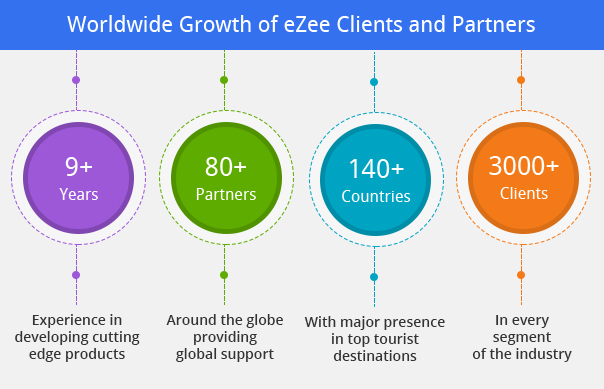 Today, eZee products are used by more than 3000 clients around the globe and in more than 140+ countries and we were able to add many new countries to that list. eZee products are being used in many new countries such as Mozambique, Ecuador, Albania, Serbia, Taiwan, Turks, Caicos Islands and many more. For existing clients we introduced certification program which covered Genuine Software License Certificate for software and Certified User certification for users. As the clientele of eZee grows year to year around the globe, it is imperative that eZee Support provides prompt expert support. 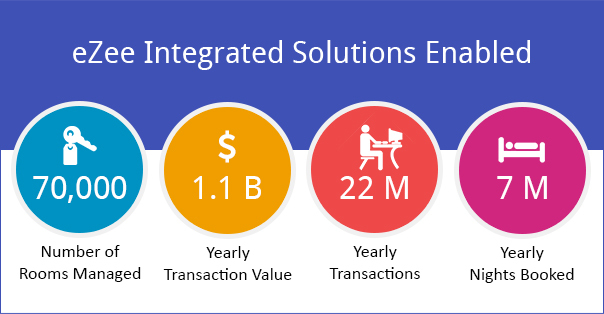 One of the key strengths of eZee Support is the unique combinations of mediums through which clients get access to support services. eZee’s support delivered services via Live Chat, Email, Phone and On-site visits around the year and was more extensive than ever. It is important that I express my gratitude to everyone here at eZee and other eZee members around the world who have made all this possible. eZee’s Partner’s Empowerment Program - We are going to expand further on various initiatives for the program and work more closely with our partners in 2015. Improve performance of eZee products and increase seamless integration between all the products. Increase communications between clients, partners and technical team for delivering new functionality and features. Thank you again for putting your trust in eZee and making 2014 a success. We couldn’t have done this without the support of our clients, business partners and team. We will ensure that 2015 is bigger and better in every aspect. For any reason if you want to reach out to me, you can email me directly at hitesh@ezeetechnosys.com. With this positive note we wish you all happy holidays and a great 2015!